For instance, at Australian Enviroblast, we specialise in the restoration of heritage properties and so are equipped and experienced to be able to remove graffiti from soft stone and the most delicate buildings and structures. However, our work is also in demand in the marine sector, where more robust abrasive blasting is needed to clean rust and other corrosion from ships, boats and yachts. Public transport is particularly vulnerable to graffiti attacks, and trains in Adelaide are frequently vandalised in this way, as are buses and trams—even our beloved and historic H-Trams. 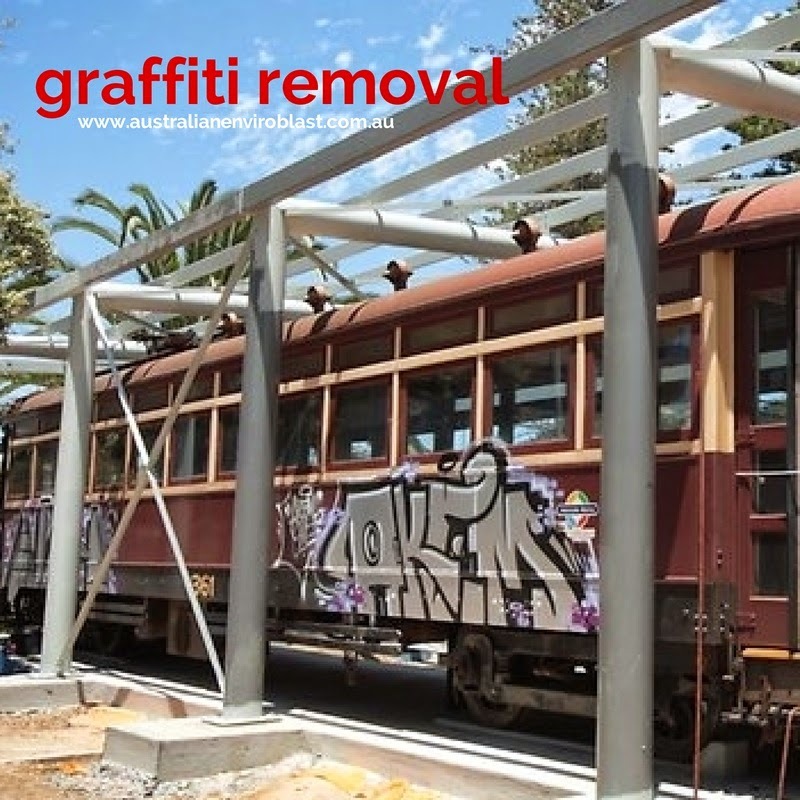 At Australian Enviroblast, our abrasive blasting services are suitable for all types of steel, metal and aluminium surfaces are so provide an ideal solution to dealing with graffiti vandalism in all areas of the public transport system. Building and construction sites in Adelaide, including the temporary fencing around them, make an attractive target for graffiti vandals. A partially-constructed building that has been graffitied doesn’t present an attractive image to the public, and if it is not attended to immediately, can attract others to attempt the same. Also, machinery and vehicles, because they are left unattended at night on these sites, can also be attacked. Our abrasive blasting services can quickly and effectively remove graffiti in any or all of these instances and restore your site to proper working order. Abrasive blasting using the Quill Falcon Kwikblast® Dustless Blasting System is an environmentally-friendly solution to graffiti removal that uses far less water than other forms of abrasive blasting and reclaims all the media used during the process. In addition, no dust is produced and so no encapsulation is required, meaning that other work can be carried out at the same time. Australian Enviroblast is licensed by the Environmental Protection Agency and adheres to its high standards of environmental safety with regards to air quality, noise, water quality and waste management. In addition, our operators are experienced in working at heights and in other types of hazardous situations. Please visit us at www.australianenviroblast.com.au or email us info@australianenviroblast.com.au and we will be happy to help you with all your graffiti removal needs.